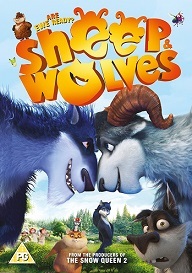 Sheep & Wolves is out on DVD 9th April, 2018. And to celebrate we have a great competition for you and 2 copies on DVD to give away. In a magical faraway land, in a picturesque little village nestled among green meadows and rolling hills, lives a flock of carefree sheep. But their pastoral and stress-free life is interrupted when a pack of wolves sets up camp in the nearby ravine. In accordance with ancient traditions, the retiring pack leader Magra announces that his future successor must prove his right to lead by vanquishing his rivals. When the powerful and blood-thirsty Ragear steps forward, the only wolf brave enough to challenge him is Grey, the pack's favorite, but a hopeless goof ball. To become a leader and win back Bianca's love, Grey goes off into the woods, where he discovers a camp of Gypsy rabbits. The fortune-teller rabbit Mami gives him a magical "transmutation potion." Grey drinks the potion and goes back to the wolves' den, but finds out upon arrival that he has been transformed into... a ram!